To some of you, this post might seem a little familiar. I wrote an editorial on dresses in the beginning of spring, but as I mentioned in my 2018 Swimsuit Edit, my editorial posts were lost during my site redesign. However, I couldn't let these pretty frocks go unaddressed (get it? ), so I'm re-releasing this post after adding some new gems I found. Designers have been killing it with dress trends this year. 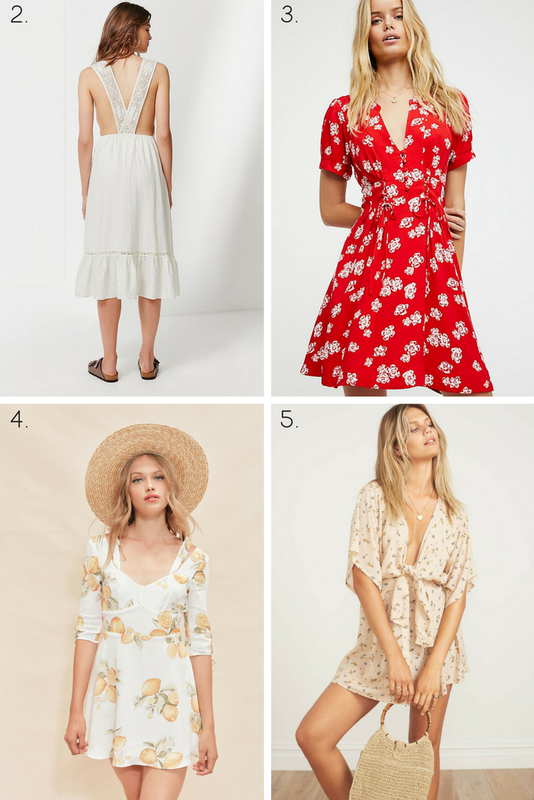 Three in particular have captured my attention: wrap dresses with ruffled skirts, button-front minis, and flowy midis with knotted fronts. No one does unique cuts like Faithfull The Brand; they designed several of the dresses in this post. Fun prints are another thing I'm loving. Lemons, florals, and gingham, oh my! 1. Jardin Print Ocean Dip Dress - Faithfull The Brand. 2. Antoinette Lace Trim Dress - Urban Outfitters. 3. Dream Girl Mini Dress - Free People. 4. Limonada Mini Dress - For Love & Lemons. 5. Kivotos Print Vinci Dress - Faithfull The Brand. 6. Blue Floral Rivera Midi Dress - Faithfull The Brand. 7. Forget Me Not Linen Babydoll Dress - CAARA.